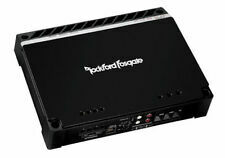 Rockford Fosgate Punch 100 IX Amp. Condition is Used. Shipped with USPS Priority Mail.
' 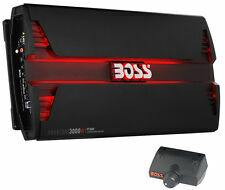 ' ---500 Watts x 2 RMS Power @ 4 Ohms ---1000 Watts x 2 Max Power @ 4 Ohms ---2000 Watts x 1 Max Power @ 4 Ohms Bridged ---750 Watts x 2 Watts RMS Power @ 2 Ohms ---Electronic Crossover Network ---Bass Boost Circuit ---Bridgeable at 4 Ohms ---2 Ohm Stereo Stable ---Double Sided Epoxy PCB Circuit Board ---Gold Plated RCA Inputs ---Line Outs for Left and Right Channels ---Low Pass Filter Controls ---High Pass Filter Controls ---Subwoofer Remote Level Control ---Power and Protection LED Indicators ---Soft Turn On/Off ---Minimum Speaker Impedance: 2 Ohms ---THD: 0. Vibe 6000 Watts 2 Channel Mosfet Amplifier SPECIAL OFFER! The Lanzar Vibe Series MOSFET Amplifiers are engineered to give you uncompromised audio performance. The professional series amplifiers are designed with the latest technology available, incorporating DC to DC switching power supplies that provide headroom for even the most demanding peaks and dynamic ranges found in today s audio files. These powerhouses are the driving force behind any great audio setup and will provide you with the sound quality and performance you ve been missing. You ll turn heads and be amazed with the clarity and richness of the bass production. Lanzar Vibe Series Amplifiers are engineered for performance and designed for the most extreme car audio enthusiasts. Anarchy Series 2-Channel Car Amplifier. Total Power Output: 2600 watts. 3-Way System Protection circuitry (thermal, overload, and speaker short protection). Note: You'll be receiving (1) Car Amplifier. QUANTUM AUDIO QPRO2500. Beta Series 2 ohm mono Amplifier with class "AB" circuitry, rated at 14.4 volts. 2500 WATT BETA SERIES. 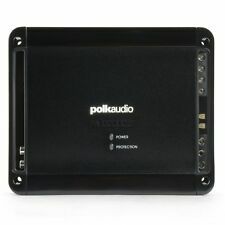 PRO AUDIO 2 CHANNEL AMPLIFIER. Buffered pre-amp input circuitry. Continuously variable 12dB low pass-x-over. SoundigitalSD250.2D Nano. 2 Channel Amplifier. Battery: 30A. Power Cabling: 6mm2. Efficiency: 95%. Mounting SMD. Maximum Consumption (musical signal): 11A. Old School Rockford Fosgate Punch 500S 2-Channel Car Amp. Works excellent! Condition is used. Shipped with USPS Priority Mail. Car Audio Compat 2-channel Class D Amplifier. 3-way protection circuitry (thermal, overload, and speaker short protection). Bridged, 4 ohms: 500 watts x 1 channel. Ultra Compact High Density Aluminum Alloy Chassis. 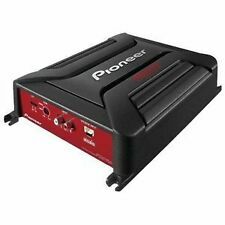 Crunch PD3000.2 Pro Power 3000 Watt Class AB 2-Channel Car Amplifier. Item Code: PD3000.2. This Pro Power model features built-in electronic crossovers and high-level inputs. 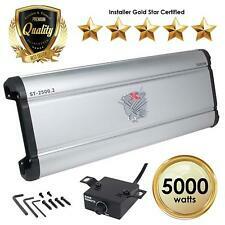 3000 Watt 2-Channel Car Audio Amplifier. 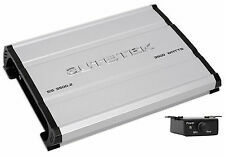 Autotek SS3500.2 Super Sport 3500 Watt 2-Channel Class A/B Car Amplifier. Item Code: SS3500.2. Features include built-in electronic crossovers and high-level inputs. Bass remote included on this 3500 watt two channel car audio amplifier. Marketing Information Enjoy compact style and super sound with the Planet Audio Pulse PL3000.2 Class A/B 2-Channel Full Range Amplifier. Bridge channels for more power and flexibility. Boost your music with the Planet Audio PL3000.2. 2 x 40A Fuses! 560w CEA Compliant! This Amp Is A Beast! BASS INFERNO BI3400PRO. 3400 WATT 2 CHANNEL AMPLIFIER. 2 Channel Stereo Amplifier / 3400 Watts. 1 x 3400 Watts @ 4 Ohm Bridged. Class AB Circuitry. Optional Bass Remote (Not Included). 2 Ohm Load Stereo Capability. 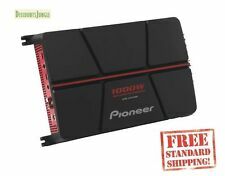 Enjoy your favorite tunes in your vehicle with the Pioneer 2-Channel Bridgeable Amplifier with 1,000 Watts. It features a bass boost so that you can rock your favorite music, podcasts, the radio and more in style. Trending at $89.71eBay determines this price through a machine learned model of the product's sale prices within the last 90 days. Crunch PD4000.2 Pro Power 4000 Watt Class AB 2-Channel Car Amplifier. Item Code: PD4000.2. This Pro Power model features built-in electronic crossovers and high-level inputs. 4000 Watt 2-Channel Car Audio Amplifier. DB DRIVE A3 PRO3000. 3000 WATT 2 CHANNEL STEREO AMPLIFIER. •Buffered Pre-Amp Input Circuitry. •Continuously Variable 12dB Bass Boost @ 45Hz. •DC Short Circuit Protection. •Max Power - 3000 Watts. •Capability - 2 Ohm Stereo. 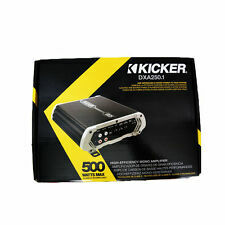 This is one of Audiopipe's most popular amplifiers with producing 1000 watts max. This is sure to give you the power you need in your car audio system. AUTHORIZED AUDIOPIPE DEALER. 3-way protection circuitry (thermal, overload, and speaker short protection). Cerwin-Vega STEALTH BOMBER Series B52. 2-Channel Bomber Series Class D Amplifier. 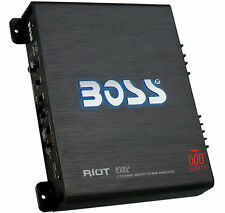 1000 Watts Peak Power, 2-Channel Class D Car Audio Amplifier. 3-way protection circuitry (thermal, overload, and speaker short protection). Timpano TPT400.2 Two Channel Amplifier. DS18 Marine Audio Logic PRV Timpano Massive Audio. 2x 6" Mid Range Loud Speakers Pro Audio 280W 4 Ohm Timpano TPT-M6-4. Timpano TPT-4P1000 4 Channel Class AB 1000w Max Amplifier. It's a bit worn appearance wise. Sounds amazing! Works perfectly with no issues. Pyramid PB3818. 5000 Watt 2 Channel Bridgeable Mosfet Amplifier. Bridgeable into 4 Ohms. Mosfet PWM Power Supplies. Fully Protected Circuitry. 1×5000W Watts 2 Bridged. Two Channel Amplification. Soft Turn On/Off Circuit. 1300 WATT 2-CHANNEL RAZOR. 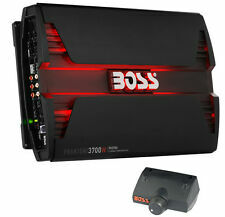 POWER ACOUSTIK RZ2-1300D. SERIES CLASS D CAR AMPLIFIER. 2-Channel RAZOR Series Full Range Class D Car Amplifier. 3-way protection circuitry (thermal, overload, and speaker short protection). Crunch PZ-2020.2 (PZ20202). Crunch Powerzone Series PZ-2020.2. 2000W Max Powerzone Series 2 ohm Stable 2 Channel Class-A/B Amplifier. Class-A/B 2 ohm Stable 2-Channel Amplifier. 6 phase alternators use less horsepower per Kilowatt than conventional 3 phase alternators. Soundstream ST2.1000D 1000 Watt 2-Channel Amplifier. 2 CHANNEL 2 OHM STABLE AMPLIFIER. Direct Short, Thermal, & Overload Circuits Protect Amplifier. 1000 WATT STEALTH SERIES CLASS-D. Don’t let these little monsters fool you. Trending at $98.22eBay determines this price through a machine learned model of the product's sale prices within the last 90 days. If you are looking for a more customized sound for your car, you should consider purchasing a two-channel car amplifier. You can find these products on eBay. Here are a few things you should consider before buying an amplifier. Can a two-channel car amplifier improve your audio system? An amplifier is an electronic device that increases the signal of your audio equipment. For example, a speaker does not have enough power to boost its signal. An underpowered speaker can sound distorted at higher volumes. An amplifier can solve this problem by adding more clarity to your music. Car amplifiers are made to work with your existing stereo system. Speakers are not the only components that need a little boost in your vehicle, though. If you like the sound of a deep bass, you may want to consider adding a subwoofer. This piece of equipment helps your audio system hit the low notes without any issues. Any extra components will need an amplifier. You can install a car amplifier anywhere in the vehicle. Wherever you choose, you need to make sure the amp is secured in the vehicle. Some amps come in mono, two, three, four, or six channels. These amplifiers have various channels to connect your equipment. Each speaker should have their own channel. In most audio setups, there is one channel per piece of equipment. This allows you to get the maximum power out of the amplifier. Tweeters and subwoofers are the exceptions since they can be connected to a mono channel. The remaining equipment is usually connected to a numbered output. An amplifier can be bridged as well. This allows you to connect your equipment in multiple ways. How much power is needed for an amplifier? When you are selecting an amplifier, you will need to know the amount of wattage required to power your components. Amplifiers have a wide range of power options. The RMS power rating of the amp is very important. The RMS measures the continuous power out of the amp. It also measures the amount the amp can handle without damage. If you want to have the best sound, you need to find an amp with a power range between 70 and 150 RMS. What brands manufacture a two-channel car amplifier?